Acting is about adopting a new identity, but performers often have to tap into their own experience when taking on a role. 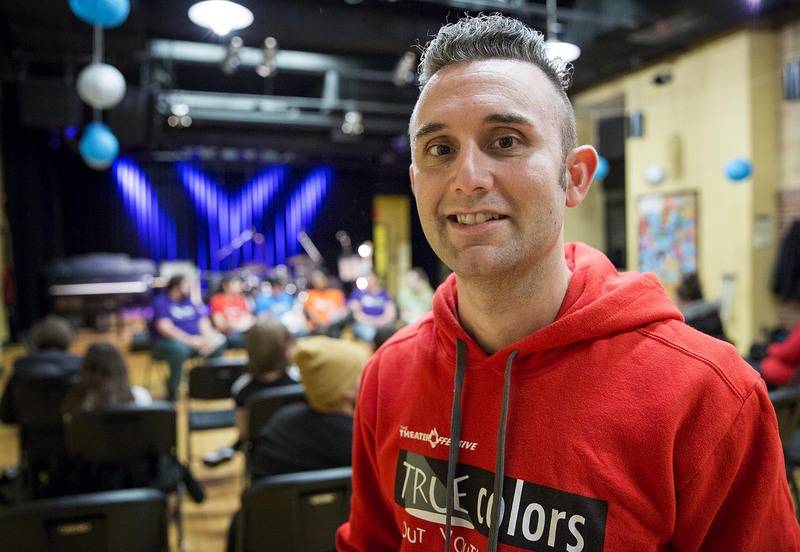 That idea is at the heart of Boston-based theater troupe True Colors, which uses theater to empower LGBT youth. 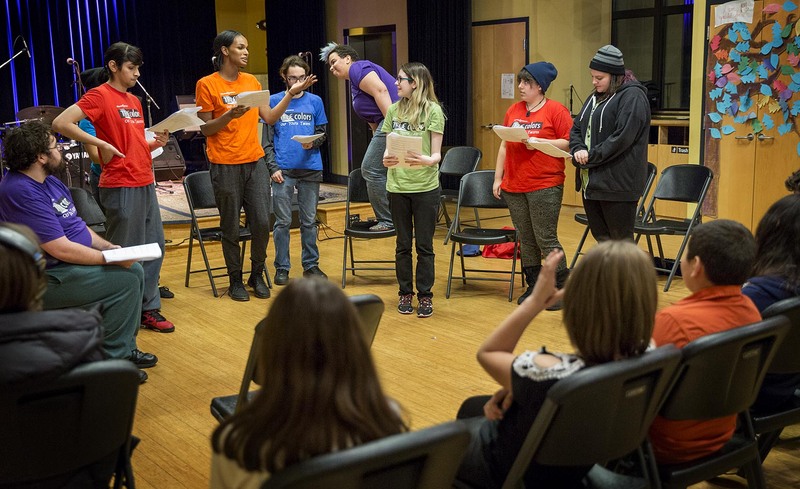 The group became the first LGBT organization to win the National Arts and Humanities Youth Program Award in a ceremony at the White House last month. 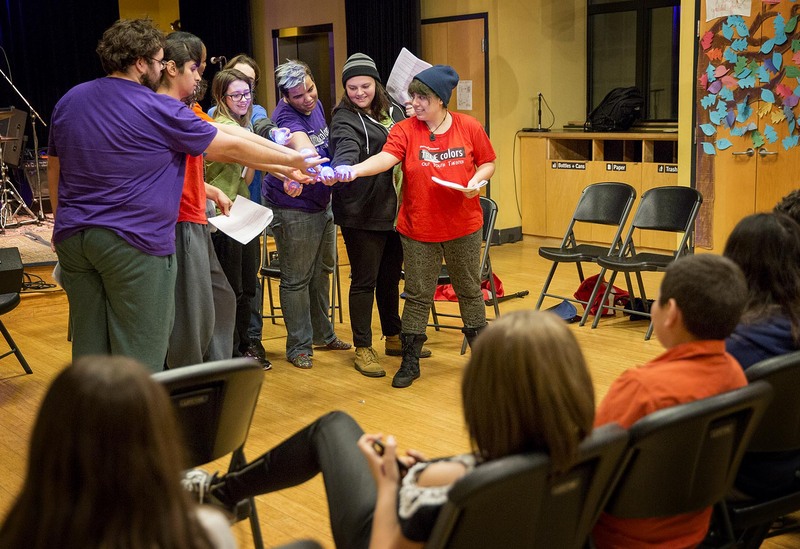 On a recent December evening, the troupe gathered onstage in the airy performance space at Zumix, an East Boston arts nonprofit. 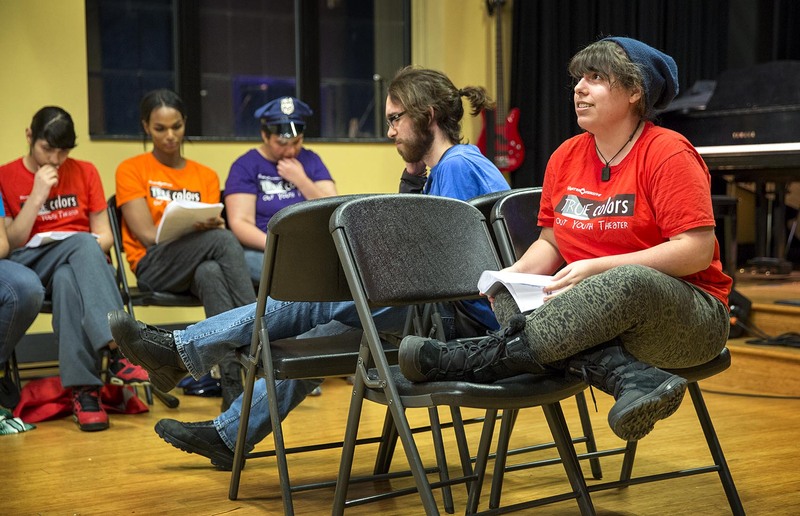 The staged reading was a casual affair — no curtains, no lighting cues — really just a chance for the actors to get feedback on their script, which they will edit and perform in the spring. The play, a sci-fi adventure called “Out in Space,” takes place in a dystopian future, and LGBT citizens are fleeing an oppressive government regime. It is also a vehicle for members of the cast to share personal stories. In between lines about running from the police and plotting escape on a spaceship are more personal vignettes based on the actors’ own experiences. Hasana Guzman Soto, of Roslindale, performs a scene about street harassment. Guzman Soto identifies as gender non-conforming, and uses the pronouns “they” and “them.” In True Colors, they are able to address that history of harassment and the feelings of self-consciousness that come along with it — all onstage, in public. For 18-year-old Trae Weekes, of Dorchester, that moment in the spotlight was transformative. “I had always tried to tell myself that I was outgoing, always, but I had a lot of stuff that I had internalized, and that I hadn’t shown outside and hadn’t let people see, or show,” she says. Her time with True Colors helped her come out to her family as a lesbian. True Colors was founded in 1994. Evelyn Francis, director of programs at True Colors’ parent organization The Theater Offensive, says that when she started working there 16 years ago, she struggled to find places for True Colors to perform. But True Colors persevered, driven by the belief that theater is an ideal tool for empowering LGBT youth and educating audiences. Francis says that since then, things have improved. The troupe started out with just a handful of participants, but now demand is overwhelming; Francis estimates that True Colors and its auxiliary programs serve up to 150 youth a year. Kids are coming out younger, and more parents are on board. Members of the troupe actually get paid to perform. But the process isn’t always easy. The troupe spends as much time editing as it does writing, and that means critiquing each other’s stories — and taking criticism. “I’m very, like, closed off about personal things. 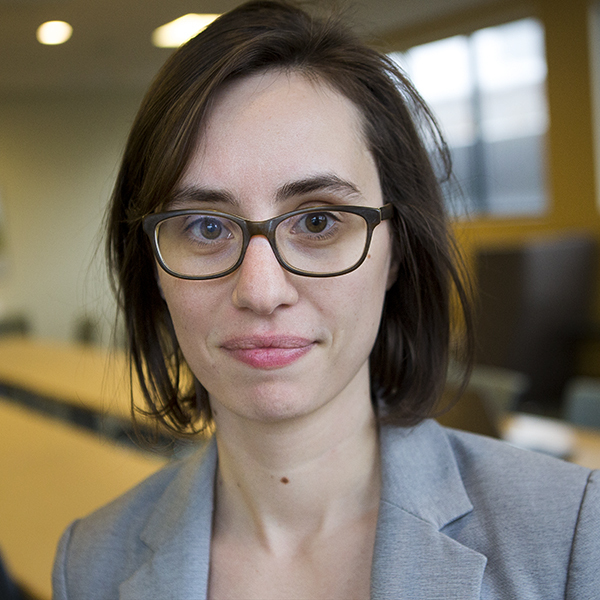 You got to achieve level-eight friendship to unlock my tragic backstory,” says Torres Charpentier, who is gender non-conforming. Sharing their story didn’t come easily. Opening up in front of an audience carries even greater risk. What if people don’t relate to your story? What if they walk out? It’s not an idle fear — incidents like this have happened. But Francis says the risk is necessary. The whole project hinges on the players’ willingness to reveal themselves onstage. At the staged reading of “Out in Space,” that sense of possibility was palpable. The show ended with all of the characters on a spaceship, ready to blast off into the unknown. A tinny voice counted down over the loudspeaker, and the sounds of an engine whooshed. Then the actors, happy and relieved, took their bows. For some members of True Colors, the spaceship probably represented an escape: from struggle, from worry, from fear. But more than that, it stood for freedom — and for a future of their own making. This segment aired on December 23, 2016.